From the depths of the bear market, the S&P 500 grew nearly 215% through its mid-May 2015 high, surpassing previous historic highs. 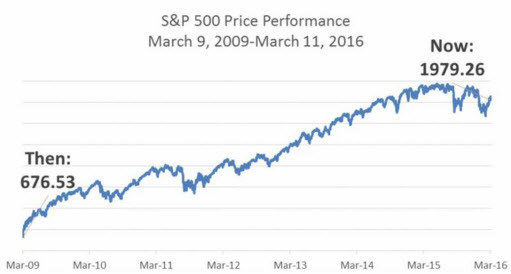 Since then, stocks have lost value, pummeled by global economic forces. However, it’s a testament to how resilient markets are that they have lost so little when faced with serious concerns about global growth. Price return between 3/09/09 and 3/11/16. Past performance is no guarantee of future results. Source: Yahoo Finance. All data as of March 11, 2016. The economy has also made major strides in the last seven years. 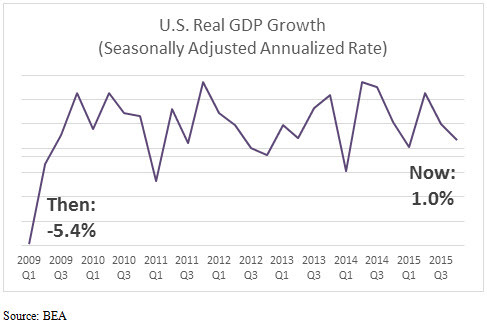 Taking a look at this chart, we can see that in the first quarter of 2009, the economy contracted by 5.4%, putting it firmly in recession territory. In contrast, the latest data from Q4 2015 shows that the economy grew by 1.0%. Now, we’re not too excited about that level of growth, but we can see that the economy has grown substantially since 2009. Over the last seven years, the economy has gained over 11.5 million jobs – far more than the 8.7 million jobs lost in the recession. While much of the growth has been in relatively low-paying industries, the improvement has been broad-based, indicating that many sectors of the economy are hiring. 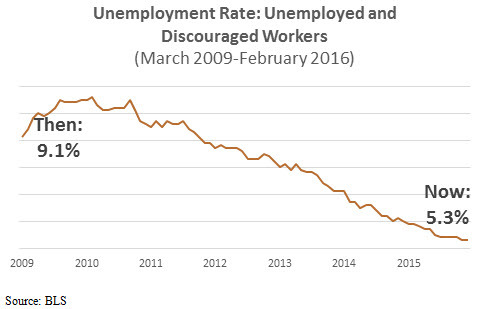 We can also see that the number of both unemployed and “discouraged” workers has been steadily declining since peaking in mid-2010. This is a broader measure of unemployment because it also captures those who are not looking for jobs because they believe no work is available. As the labor market improved, more Americans gained confidence in their prospects and returned to the labor market. 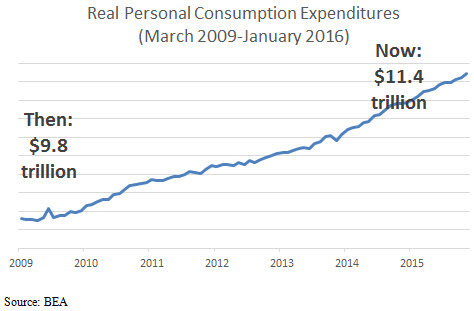 In tandem with the increase in available work, Americans opened their wallets and started spending again, increasing personal spending by 15.9% over the last seven years. Since consumer spending accounts for about 70% of economic activity, it represents a driving force for our economy. Though we don’t have February or March data yet, consumer spending still appears to be on a healthy trajectory. With all of the talk of recession and bear markets, it can be easy to lose sight of just how far we’ve come during this rally. We don’t believe that it’s possible to accurately time the beginning or end of any market cycle. Since we can’t predict where markets will go later this year, we can take a look at underlying fundamentals and make prudent adjustments to investment strategies as needed. We’re keeping a close eye on markets and will continue to keep you informed. The week ahead is packed with data. In addition, investors have two central bank meetings in what the media is calling “bank-a-palooza,” a series of meetings by the ECB, Federal Reserve, and Bank of Japan to decide monetary policy. While the Fed isn’t expected to raise interest rates again next week, officials could provide valuable insight into the timing of future rate hikes. If economic data supports further increases, investors could confront the possibility of multiple rate hikes this year. China trade data shows slowdown. Exports from the world’s second-largest economy dropped 25.4% in February, far worse than estimates, stoking concerns about China’s growth in 2016. Weekly jobless claims fall. Oil rallied last week after the International Energy Agency reported that after months of lows, oil may have bottomed out now that producers are working to stabilize prices.